This article is about the species Lens culinaris. For the meaning of "lentil" in Indian English, see pulse (legume). 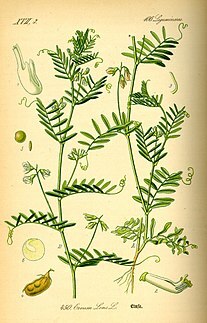 The cultivated lentil Lens culinaris was derived from its wild subspecies L. culinaris subsp. orientalis, although other species may also have contributed some genes, according to Jonathan Sauer (Historical Geography of Crop Plants, 2017.) Unlike their wild ancestors, domesticated lentil crops have indehiscent pods and nondormant seeds. Lentils are the oldest pulse crop known, and among the earliest crops domesticated in the Old World, having been found as carbonized remains alongside human habitations dating to 11,000 BC in Greece. The lentil is indigenous to Western and Central Asia. Many different names in different parts of the world are used for the crop lentil; lentil (English), adas (Arabic), mercimek (Turkish), messer (Amharic), masser or massur (Hindi) and hiramame (Japanese) are the most common names. The first use of the word lens to designate a specific genus was in the 16th century by the botanist Tournefort. The genus Lens is part of the subfamily Faboideae which is contained in the flowering plant family Fabaceae or commonly known as legume or bean family, of the order Fabales in the kingdom Plantae. Lentil is hypogeal, which means the cotyledons of the germinating seed stay in the ground and inside the seed coat. Therefore, it is less vulnerable to frost, wind erosion, or insect attack. The plant is a diploid, annual, bushy herb of erect, semierect, or spreading and compact growth and normally varies from 30 to 50 cm (10 to 20 in) in height. It has many hairy branches and its stem is slender and angular. The rachis bears 10 to 15 leaflets in five to eight pairs. The leaves are alternate, of oblong-linear and obtuse shape and from yellowish green to dark bluish green in colour. In general, the upper leaves are converted into tendrils, whereas the lower leaves are mucronate. If stipules are present, they are small. The flowers, one to four in number, are small, white, pink, purple, pale purple, or pale blue in colour. They arise from the axils of the leaves, on a slender footstalk almost as long as the leaves. The pods are oblong, slightly inflated, and about 1.5 cm long. Normally, each of them contains two seeds, about 0.5 cm in diameter, in the characteristic lens shape. The seeds can also be mottled and speckled. The several cultivated varieties of lentil differ in size, hairiness, and colour of the leaves, flowers, and seeds. Lentils are self-pollinating. The flowering begins from the lowermost buds and gradually moves upward, so-called acropetal flowering. About two weeks are needed for all the flowers are open on the single branch. At the end of the second day and on the third day after the opening of the flowers, they close completely and the colour begins to fade. After three to four days, the setting of the pods takes place. In 2016, global production of lentils was 6.3 million tonnes, led by Canada with 51% and India with 17% of the world total (table). Saskatchewan is the most productive growing region in Canada (95% of Canadian lentils grown). For 2016, Statistics Canada reported a national production yield of 3.2 million tonnes from 5,700,000 acres (2,300,000 ha) harvested. Lentils can grow on various soil types, from sand to clay loam, growing best in deep sandy loam soils with moderate fertility. A soil pH around 7 would be the best. Lentils do not tolerate flooding or water-logged conditions. Lentils improve the physical properties of soils and increase the yield of succeeding cereal crops. Biological nitrogen fixation or other rotational effects could be the reason for higher yields after lentils. The conditions under which lentils are grown differ across different growing regions. In the temperate climates lentils are planted in the winter and spring under low temperatures and vegetative growth occurs in later spring and the summer. Rainfall during this time is not limited. In the subtropics, lentils are planted under relatively high temperatures at the end of the rainy season, and vegetative growth occurs on the residual soil moisture in the summer season. Rainfall during this time is limited. In West Asia and North Africa, some lentils are planted as a winter crop before snowfall. Plant growth occurs during the time of snow melting. Under such cultivation, seed yields are often much higher. The lentil requires a firm, smooth seedbed with most of the previous crop residues incorporated. For the seed placement and for later harvesting it is important that the surface is not uneven with large clods, stones, or protruding crop residue. It is also important that the soil is made friable and weed-free so that seeding could be done at a uniform depth. The plant densities for lentils vary between genotypes, seed size, planting time and growing conditions and also from region to region. In South Asia a seed rate of 30–40 kg/ha is recommended. In West Asia countries a higher seed rate is recommended and also leads to a higher yield. The seeds should be sown 3–4 cm deep. In agriculturally mechanized countries, lentils are planted using grain drills, but many other areas still hand broadcast. In intercropping systems – a practice commonly used in lentil cultivation – herbicides may be needed to assure crop health. Similar to many legume crops, lentils can fix atmospheric nitrogen in the soil with specific rhizobia. Lentils grow well under low fertilizer input conditions, although phosphorus, nitrogen, potassium, and sulfur may be used for nutrient-poor soils. Below is a list of the most common lentil diseases. Root lesion nematode Pratylenchus spp. A combination of gravity, screens and air flow is used to clean and sort lentils based on shape and density. After destoning, they may be sorted by a color sorter and then packaged. A major part of the world’s red lentil production undergoes a secondary processing step. These lentils are dehulled, split and polished. In the Indian subcontinent, this process is called dhal milling. The moisture content of the lentils prior dehulling is crucial to guarantee a good dehulling efficiency. The hull of lentils usually accounts for 6 to 7% of the total seed weight, which is lower than most legumes. Lentil flour can be produced by milling the seeds, like cereals. Lentils are consumed in many ways. They can be eaten soaked, germinated, boiled, fried and baked. The most common preparation method is boiling. The seeds require a cooking time of 10 to 40 minutes, depending on the variety; shorter for small varieties with the husk removed, such as the common red lentil. Most varieties have a distinctive, earthy flavor. Lentils with husks remain whole with moderate cooking; lentils without husks tend to disintegrate into a thick purée, which leads to quite different dishes. The composition of lentils leads to a high emulsifying capacity which can be even increased by dough fermentation in bread making. Lentils are used worldwide to cook many different dishes. Lentil dishes are most widespread throughout South Asia, the Mediterranean regions and West Asia. In the Indian subcontinent, lentil curry is part of the everyday diet, eaten with both rice and roti. Boiled lentils and lentil stock are used to thicken most vegetarian curries. They are also used as stuffing in dal parathas and puri for breakfast or snacks. Lentils are also used in many regional varieties of sweets. Lentil flour is used to prepare several different bread varieties, such as papadum. They are frequently combined with rice, which has a similar cooking time. A lentil and rice dish is referred to in Levantine countries as mujaddara or mejadra. In Iran, rice and lentil is served with fried raisin; this dish is called adas polo. Rice and lentils are also cooked together in khichdi, a popular dish in the Indian subcontinent (India and Pakistan); a similar dish, kushari, made in Egypt, is considered one of two national dishes. Lentils are used to prepare an inexpensive and nutritious soup all over Europe and North and South America, sometimes combined with some form of chicken or pork. In western countries, cooked lentils are often used in salads. Lentils are commonly eaten in Ethiopia in a stew-like dish called kik, or kik wot, one of the dishes people eat with Ethiopia's national food, injera flatbread. Yellow lentils are used to make a non-spicy stew, which is one of the first solid foods Ethiopian women feed their babies. The low levels of readily digestible starch (5%) and high levels of slowly digested starch make lentils of potential value to people with diabetes. The remaining 65% of the starch is a resistant starch classified as RS1. A minimum of 10% in starch from lentils escapes digestion and absorption in the small intestine (therefore called "resistant starch"). Additional resistant starch is synthesized from gelatinized starch, during cooling, after the lentils were cooked. Although lentils have been an important crop for centuries, lentil breeding and genetic research has a relatively short history compared to many other crops. Since the inception of The International Center for Agriculture Research in the Dry Areas (ICARDA) breeding programme in 1977 significant gains have been made. It supplies landraces and breeding lines for countries around the world, supplemented by other programmes in both developing (e.g. India) and developed (e.g. Australia and Canada) countries. In recent years, such collaborations among breeders and agronomists are becoming increasingly important. The focus lies on high yielding and stable cultivars for diverse environments to match the demand of a growing population. In particular, progress in quantity and quality as well as in the resistance to disease and abiotic stresses are the major breeding aims. Several varieties have been developed applying conventional breeding methodologies. Serious genetic improvement for yield has been made, however, the full potential of production and productivity could not yet be tapped due to several biotic and abiotic stresses. Crosses generally fail between members of different gene pools. However, plant growth regulators and/or embryo rescue allows the growth of viable hybrids between groups. Even if crosses are successful, many undesired genes may be introduced as well in addition to the desired ones. This can be resolved by using a backcrossing programme. Thus, mutagenesis is crucial to create new and desirable varieties. According to Yadav et al. other biotechnology techniques which may impact on lentil breeding are micro-propagation using meristamatic explants, callus culture and regeneration, protoplast culture and doubled haploid production. ^ a b Sauer, Jonathan D. (2017). Historical Geography of Crop Plants: A Select Roster. Routledge. ISBN 9781351440622. The primary progenitor of the cultigen is evidently L. orientalis native to the Near East; the other species may have contributed some genetic diversity to the crop. L. culinaris (L. esculentus), the domesticate, differs from the wild species in having indehiscent pods, due to a single recessive gene, and nondormant seeds. ^ "Pulse Australia - Southern guide". pulseaus.com.au. Retrieved 18 November 2017. ^ "What To Do With Lentils And Why Bother". The Chalkboard. 17 March 2014. Retrieved 6 November 2017. ^ "Cook's Thesaurus: Lentils". Foodsubs.com. Retrieved 15 December 2015. ^ a b "Production of lentils in 2016; Crops/World Regions/Production Quantity from pick lists". United Nations, UN Food and Agriculture Organization, Statistics Division (FAOSTAT). 2017. Retrieved 28 March 2018. ^ "Lentils". Lentils.org. 2018. Retrieved 28 March 2018. ^ "Lentil: 2016 Specialty Crop Report" (PDF). Government of Saskatchewan. 2017. Retrieved 28 March 2018. ^ "Crop Profile for Lentils in Idaho". Department of Plant, Soil and Entomological Science, University of Idaho (web site). 2000. ^ Leah A. Zeldes (16 February 2011). "Eat this! Lentils, a prehistoric foodstuff". Dining Chicago. Chicago's Restaurant & Entertainment Guide. Retrieved 4 August 2011. ^ HUGHES, Joe S.; Swanson, Barry G. (1986). "Microstructure of lentil seeds (Lens culinaris)". Food Structure. 5: 241–246 – via digitalcommons.usu.edu. ^ Bora, Pushkar Singh (2002). "Functional properties of native and succinylated lentil (Lens culinaris) globulins". Food Chemistry. 77 (2): 171–176. doi:10.1016/s0308-8146(01)00332-6. ^ US Department of Agriculture, National Nutrient Database for Standard Reference Release 28 (2016). "Full Report (All Nutrients): 16069, Lentils, raw". Retrieved 15 December 2015. ^ "Nutrition Facts for Raw Lentils, 100 g". Conde Nast, USDA National Nutrient Database, version SR-21. 2014. Retrieved 24 March 2015. ^ "Lentils, mature seeds, cooked, boiled, without salt per 100 g". Conde Nast, USDA National Nutrient Database Release SR-21. 2016. Retrieved 6 October 2016. ^ Zhang, Bing; Deng, Zeyuan; Tang, Yao; Chen, Peter; Liu, Ronghua; Ramdath, D. Dan; Liu, Qiang; Hernandez, Marta; Tsao, Rong (2014). "Fatty acid, carotenoid and tocopherol compositions of 20 Canadian lentil cultivars and synergistic contribution to antioxidant activities". Food Chemistry. 161: 296–304. doi:10.1016/j.foodchem.2014.04.014. ISSN 0308-8146. PMID 24837953. ^ Ramdath D, Renwick S, Duncan AM (2016). "The Role of Pulses in the Dietary Management of Diabetes". Can J Diabetes (Review). 40 (4): 355–63. doi:10.1016/j.jcjd.2016.05.015. PMID 27497151. ^ Tovar J (1996). "Bioavailability of carbohydrates in legumes: digestible and indigestible fractions". Arch Latinoam Nutr. 44 (4 Suppl 1): 36S–40S. PMID 9137637. ^ Johnson, Casey R.; Thavarajah, Dil; Thavarajah, Pushparajah; Payne, Scott; Moore, Jayma; Ohm, Jae-Bom (2015). "Processing, cooking, and cooling affect prebiotic concentrations in lentil (Lens culinaris Medikus)". Journal of Food Composition and Analysis. 38: 106–111. doi:10.1016/j.jfca.2014.10.008. ^ Egli, I.; Davidsson, L.; Juillerat, M.a. ; Barclay, D.; Hurrell, R.f. (1 November 2002). "The Influence of Soaking and Germination on the Phytase Activity and Phytic Acid Content of Grains and Seeds Potentially Useful for Complementary Feedin". Journal of Food Science. 67 (9): 3484–3488. doi:10.1111/j.1365-2621.2002.tb09609.x. ISSN 1750-3841. ^ a b Kumar, Jitendra; Gupta, Sunanda; Gupta, Priyanka; Dubey, Sonali; Tomar, Ram Sewak Singh; Kumar, Shiv (2016). "Breeding strategies to improve lentil for diverse agro-ecological environments". Indian Journal of Genetics and Plant Breeding (The). 76 (4): 530. doi:10.5958/0975-6906.2016.00071.7. ISSN 0019-5200.